The theory that the first cells arise from physical-chemical processes, today fully accepted, arose almost necessarily. C. Darwin proposed in the Origin of the species that organisms come from other organisms and that the differences between them, which can potentially give rise to new species, are achieved with natural selection acting on the phenotypic variability of such organisms. The cellular theory says in one of its postulates that every cell comes from another cell, but L. Pasteur eliminated the possibility of spontaneous generation, even for the simplest organisms. 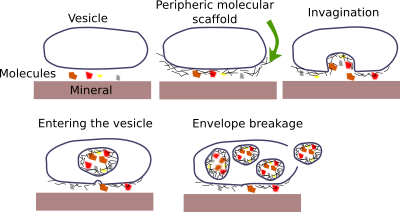 All this leads to the first cell emerging from inanimate substances, a kind of spontaneous generation; not the one refuted by L. Pasteur but a progressive and complex generation from simple molecules that would gain complexity in their structures, composition and especially in the interactions between each other. In the succession of stages that led from the simplest molecules to the first cells, there was a moment in which molecules or groups of molecules with the capacity of self-replication and to undergo natural selection appeared. Once this, the rest could be explained by Darwinian selection at the molecular level! The candidates to be the first protagonists of evolution could be two of the main molecules that constitute nowadays the cells, DNA and proteins. But they have been left out because of the difficulties they present. DNA is a good support to store information, it is very stable and allows for variability, but it is practically inert and does not have the capacity to self-replicate. Proteins have a high catalytic capacity, that is, they "do things", but self-replicating their amino acid sequence seems nowadays unapproachable. Then, who could be the candidate? 1.- It has catalytic capacity. The ribonucleoproteins are capable of processing the primary transcripts in the nucleus and the ribosomal RNA participates critically in the synthesis of proteins in the ribosomes. 2.- It transports information. The messenger RNA collects the information from the DNA and carries it to the ribosomes where it is read for the synthesis of the proteins. 3.- Ribonucleotides, such as ATP (adenosine triphosphate), are the energetic molecules by excellence of living beings. Cofactors such as NAD+ or FAD are crucial in many biochemical reactions. 4.- RNA molecules subjected to controlled conditions are capable of evolving. 5.- Transfer RNAs are responsible for recognizing amino acids and place them in a determinate sequence when they read a mRNA chain. 6.- DNA replication requires the presence of small RNA segments called primers. 7.- Most of the DNA that encodes for RNA does not do so for mRNA but for RNA that will not be translated into proteins and that performs numerous cellular functions. It seems that the proportion of DNA that transcribes to messenger RNA is minimal compared to that which transcribes in non-coding RNA. These RNAs can regulate gene expression, DNA compaction, DNA methylation, cell differentiation, and so on. All these observations suggest the RNA as the potential versatile molecule necessary at the origin of life, but do not conclude that it has been. Some authors see the large number of functions performed by different types of RNA in the cell because of the preponderant role of RNA in prebiotic chemistry. There are, however, weaknesses in this proposal and alternative arguments. It is difficult to reconstruct all the steps simulating original conditions. Ribonucleotides are difficult of synthesize and their components degrade easily, although it has been shown that in the presence of minerals with boron and under some possible conditions on Earth at that time, ribonucleotides can be formed and with certain stability; however, they would be produced in very few quantities and conditions would be very unlikely. Nevertheless, there would remain the enormous problem of assembling them of useful way. Apart from the enormous obstacle of polymerization, we would have another major obstacle: the probability that a polymer with capacity of self-replication will be formed by chance is so low that some scientists reject this possibility. Some scientists do not accept these theories because of the high improbability of all these steps being taken consecutively. For this reason, Oparin’s proposal of coacervates or metabolic complexes has been resumed. The basis of this theory is that the first entities that were able to replicate or divide were sets of molecules that underwent a series of reactions in a way that established a cycle of chemical reactions. Probably the best place was the fumaroles, but the white fumaroles, which are less extreme than the black fumaroles. In this way, the compounds regenerated and increased in number with the intake of substrates and external energy. An important point of this idea is the need for isolation from the external environment, which could be caused by chemical films or by insulation in hollows of rocks (see figure). Cuando abro la figura en el atlas no me aparece con fondo blanco?! Therefore, the order of some of the sections placed in the main page of the site should be changed, such as the envelope before the self-replication. These aggregates would gain in complexity to produce the RNA, which in the background is not dispute that it was before the DNA and proteins. This implies that, before the appearance of the RNA world, there would be a pre-RNA world. Michalak R. RNA world - the dark matter of evolutionary genomics. Journal of evolutive biology. 2006. 19(6):1768-1774. Müller UF. Recreating an RNA world. Cell Molelular life science. 2006. 63:1278-1293.